NOTE: Please *DILUTE Essential Oils in a Carrier Oil (Jojoba Oil - preferred or other nut/seed oil) before applying to the skin. *2% dilution for Adults is usually advised (*2 drops of E.O. per 1 Teaspoon of Carrier Oil or Lotion OR *12 drops of E.O. per 1 ounce of Carrier Oil, Lotion, or in Water for a Spray, and 1% or Less for Children 6yrs and up, Pregnancy, Elderly, or Sensitive People). Introducing Caelestis Essentials-- our line of Pure, Organic, Wildcrafted, Grown Without Pesticides, Unadulterated Tested For Quality and Purity Essential Oils!!! Formerly originated and distributed by Celestine Gifts and Books in Pottstown, Pa., these are Excellent Quality essential oils to buy online. We list on each bottle the Country of Origin, Method of Extraction, Part of Plant Used, and Farming Practice. See the legend key on the right for information regarding farming practice and extraction methods. We acquire our Essential Oils from Quality Environmentally Conscious Distillers from all around the world and package them in bottle sizes from 1/2 dram to 1 ounce. We carry over 50 different types of essential oils. These Essential Oils have been Tested by State-of-the-Art Gas Chromatography-Mass Spectrometry (GC-MS) which rigorously tests the Veracity of the Purity and Potency of our Sourced Oils. This ensures we have superior Essential Oils and products at all times. All of our Organic Essential Oils are NOP/USDA certified which means you can rely on receiving truly Certified Organic Essential Oils. They are 100% pure and natural and are free of herbicidal residue, pesticides and synthetic fertilizers. To Purchase a Diffuser for use with Essential Oils, please Click on the "Diffuser World" Banner to the right here... Or Click on the "Diffuser" Tab on the top of the page. This will take you to "Diffuse World" website (our affiliate partner) and you can make your diffuser purchase through that website. For Aromatherapy Jewelry purchases please click on our "Aromatherapy Jewelry" tab. Caution: Essential Oils are for Inhalation and Topical Use Only, (External Use Only) unless you are Medically Prescribed to take them Internally. Avoid Contact with Eyes. Keep out of Reach of Children and Pets. Dilute with a Carrier Oil before Applying to the Skin. Store in a Cool Dark Place. Essential Oils are not FDA approved. No Medical Claims are Made by Enchanted Essences. Our "Essential 6-Pack": Enchanted Essences Created this Convenient Kit to Take with you on the Go or Keep in your Medicine Cabinet. 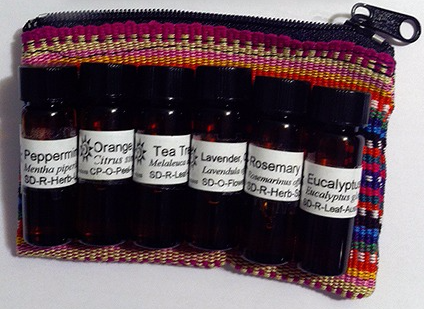 6 Certified Organic Essential Oils: lavender, tea tree, eucalyptus, orange, peppermint, rosemary. It Contains an Instruction Card giving Suggestions for Use. View or Buy Our Essential 6 Pack Here.